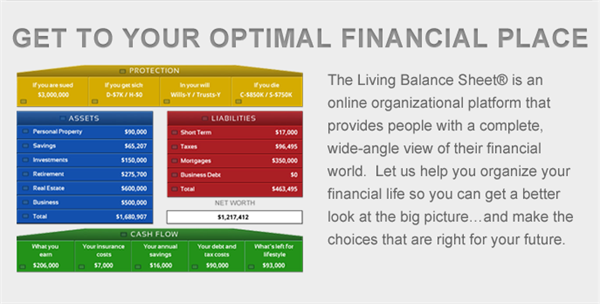 Strategic Wealth Design is an authorized user of the Living Balance Sheet®, a powerful tool and revolutionary web technology that can help you with budgeting, protecting what’s important, and achieving financial balance. The Living Balance Sheet® provides you with a consolidated and up-to-date view of your complete financial picture. With one account, you gain access to daily updates for all of your assets, liabilities, insurance protection and cash flow.